Are You And Your Family Prepared Should Disaster Strike? “Our hearts are in our throats,” said a distraught California property owner waiting to hear whether wildfires raging in Northern California had destroyed her home and everything in it. Wildfires consumed 9.7 million acres in the United States in 2017 and continue to be a challenge in 2018. Since fireworks go hand in hand with holidays, keep in mind that fireworks spark an average of over 18,000 fires in the US every year. Are your family and your property prepared for wildfire? Californians may use the READY for Wildfire CAL FIRE app. This includes wildfire family preparation checklists for taking charge of your Defensible Space, for creating an evacuation and family communication plan, and for assembling an emergency supply kit. 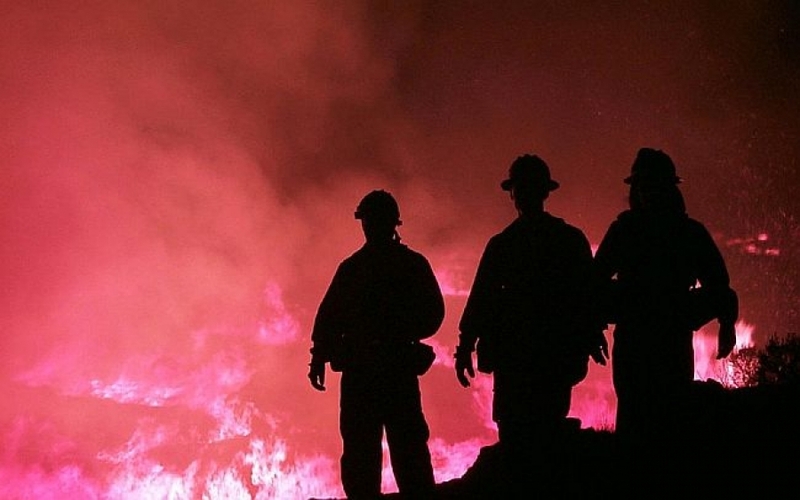 The app also provides Customized Wildfire Texts or Push Notifications and alerts when wildfire is reported in a chosen zip code or within 30 miles of home. The National Ocean and Atmospheric Administration National Weather Service Storm Prediction Center provides fascinating maps which predict severe weather thunderstorms and tornados as well as weather-influenced wildfires. Be prepared +600 Homes Lost in Hawaiian Eruption! : Across the Pacific Ocean, more than 2000 miles west of California, Hawaii is currently suffering a devastating natural violent event – the eruption of Kilauea Volcano on the Big Island, formally known as the Island of Hawaii. Earthquakes, which have residents “shook out of bed,” are a powerful side-effect included in the devastation and disruption caused by the eruption, according to 29-year Big Island resident Randy A. Hart, Director of Kilauea Military Camp, a mountain resort located inside Hawaii Volcanoes National Park. Kilauea Military Camp and the Park remain closed due to increased and damaging earthquakes, corrosive volcanic ash, and continuing explosions from Halema‘uma‘u, the summit crater of Kilauea Volcano. Rotarian Hart recently attended the 2018 Rotary International Convention where he was part of “Aloha Hawai’i,” the Rotary contingent representing Hawaii. Another significant eruption side-effect is VOG which is like fog, but is a mix of volcanic ash and rain or steam and sulphur dioxide. There’s also LAZE, a haze which occurs when molten lava mixes with seawater. These corrosive vapors, carried down the coast by Tradewinds, present health concerns and broaden the impact area. Hart explained that dealing with FEMA bureaucracy and insurance administration has these highly-stressed residents “out in the cold” until they can receive compensation which will allow them to move on from the daily struggle for temporary housing, meals, and support to resolve their long-term survival issues. Those who actually have property insurance are vulnerable to insurance company policies and interpretations of coverage. Since many homes are actually destroyed by fire from proximity to molten lava, fire insurance may cover some loss. Other policies specifically deny coverage for damage attributed to lava. Insurers may also deny claims if property owners have been away from their home (under mandatory evacuation) for extended periods. A “market of last resort” option lies with the Hawaii Property Insurance Association, a nonprofit collection of insurance companies created by the State to provide basic property insurance for those who cannot buy coverage from private insurers. Since this coverage is more limited and rates for basic coverage are higher, homeowners may still not be as secure as they’d like. What does your insurance cover you and your property for if disaster hits? Previous eruptions did not destroy property on this scale, which has been estimated at $400 million in property loss alone, with no sign of the eruption ending. On the slopes of an active volcano, the Big Island’s Puna region—which is being decimated by the Kilauea eruption—became a popular and very affordable residential area as property values rose across the Island chain. Now, entire subdivisions like Vacationland have disappeared under lava and the real estate market is in limbo. If a property is buried under lava and ash, the property owner still owns it, even if it cannot be used, sold, or even accessed. The county has deemed homes and lots in the eruption zone to have zero value since buyers will not pay to purchase this real estate—to the frustration of owners. Hart suggested that there is talk the state may undertake land exchanges of lava-buried property for safe habitable land. This is not finalized, but will require state and county governments to agree to this land swap. Disaster areas that normally rely on tourism, like Hawaii, can be doubly hard hit. When visitors cancel vacations, locals and businesses suffer further economic loss. Hart stressed that eruption effects are localized and that Hawaii is still open for business and for vacations. Aloha Hawai’i! Disaster can strike whether you’re prepared or not!